As a teenager and young adult, I have always struggled with my weight, and have never truly had a normal relationship with food. I would binge and then feel so guilty I would punish myself by not eating at all. I was also in a very verbally abusive relationship where my size and weight was thrown in my face constantly. Being young and naive I allowed it to hurt and control me way more than it should have. Thankfully I am now married to a man who loves me no matter what size I am and has done nothing but support me on this fitness journey. When I first joined the Training Loft 714, I knew that I wanted to take on something completely out of my comfort zone and compete in a fitness competition. With help of owner and amazing coach Denise, I did my first competition this April and not only placed but won the show overall. I'm still in complete shock. Growing up and constantly being the chubby kid, I never dreamed in a million years that this would now be a part of my lifestyle. The Loft not only offers support but they really take their time to teach you how to adopt a healthy lifestyle. Now I'm officially part of the amazing Bay Area Knockouts team and I plan on competing again soon. From 2015 to 2017 I battled with my weight due to the lack of self acceptance of my sexuality, feeling uninspired in my career, and feeling not worthy enough to be loved. I felt overwhelmed with self doubt and I transmitted those insecurities and found myself at 189 pounds masking my depression with food and alcohol. In 2016, I met a friend who introduced me to clean eating and the Training Loft714 where I begun finally building stepping stones in my growth. Robin believed in me and guided me in health and fitness and I dropped down to 168 pounds by the end of 2016. In 2017, I still battled with my insecurities and I fought so hard to find the root to my weight and why I stayed stagnant in the 170s/160s. After months of soul searching, reading, praying, and writing I finally realized I was blocking my own growth and once and for all I need to find something in my life to give me substance, push me, give me reason, help sustain me mentally and physically, I needed something empowering, I needed to be around women like myself, I needed to be alive again. I decided to train at the Training Loft714 to become a Bay Area Knockout, the ultimate alpha female; fearless, confident, hard working, beautiful, and divine. I have gained will power, substance, humbleness, confidence, self respect, pride in my sexuality, and reassurance that I can achieve any goal I set my soul to. I have lost 61 pounds from 189lbs to 128lbs, I am transformed and I now transmit gratitude. I am forever evolving and I will continue to fitness train to reach higher levels of happiness and compete in bodybuilding shows. I am forever grateful for Denise for forming the Bay Area Knockouts, I am now a powerful worthy woman! Ever since I was diagnosed with long qt, irregular arrhythmias, having back to back pregnancies, being medically retired from the military and then 2.5 years of culinary school, I have struggled with my weight. I manage to lose weight and then gain back a little when I stop being consistent. After graduating from culinary school, I had more time on my hands and started dedicating myself to lifting weights and eating clean. I was determined to be fit and accomplished this in 2014-2015. Then early summer of 2015, my dad had a heart attack and went through triple bypass surgery. I took the summer off from working out to help him during his recovery and once I got back, it was hard to get motivated. The weight slowly came back and I needed to find a new goal to challenge myself. That's when I looked into competing and found the Training Loft. I started off 2017 meal prepping and going to the classes. I wasn’t mentally prepared to compete last year, but I was able to lose 15 lbs. This year I was even more determined to hit the stage and on April 28, I was able to reach my goal. Becoming a Knockout has given me so much more confidence and I learned to be out of my comfort zone. I’m already planning on competing in upcoming shows this season and being a better version of me. The past 16 weeks has changed my life in so many ways! I’ve learned so many things about myself. I learned how to love my body. It is amazing!! I’ve witnessed my body go through 2 pregnancies. It wasn’t until I was 5 months post-partum with my second child when I didn’t feel like myself. I was very insecure, hated the way I looked in clothes, and had no energy to do anything. Although my husband, family, and friends accepted me at any size... I craved for change. I remember joining the Training Loft in January 2017 and watching the Knockout women train for competitions inspired me to join one. These ladies were motivated, dedicated, and showed so much perseverance that I wanted in on the action! With the guidance of my coach Rosini, I was able to push my body to its limits. She kept me on a strict diet and workout regimen. There were many times I wanted to give up, but with the support of my coach and team, they kept me going. They made sure I made no excuses and was accountable for doing the work. Joining this competition wasn’t just a physical transformation for me, it transformed my lifestyle and whole being. I learned the value of loving myself and my body at all stages and circumstances in life. I learned that if you put your heart, mind, and soul into something, you can do wonders! It is an indescribable feeling and this is just the beginning of an amazing journey. Always dig deep, believe in yourself and never stop growing as a person. Throughout my whole life I’ve always been known as “thick, curvy, big boned” . I have been so self conscious and never comfortable within my own skin. Even though others have complimented my curves I was never able to truly embrace my body. 3 years ago after ending a controlling and mentally abusive relationship I became a single Mama. The stress had taken a toll on me mentally and physically. I had joined the Training Loft and really enjoyed attending all the classes. They became an outlet for my stress and anxiety. I’ve always loved fitness and had taught kick boxing classes in my 20s and knew I found my new favorite gym when I joined the Loft. During the last 3 years I have watched so many woman of all ages and sizes join The Bay Area Knockouts team and was mesmerized by their dedication, accomplished goals and bond. I wanted so badly to verbally commit to competing with them but didn’t have faith in myself that I would follow thru to the end. As a Mom I felt guilty for putting myself first and focusing so much energy on myself. When I started becoming more serious about wanting to join the team I spoke with my boyfriend about it. Although he loved me the way I was and made that so clear to me every day, he knew I wasn’t comfortable with myself and that I wanted to be in better shape and healthier. He became my biggest supporter and #1 cheerleader. I’m forever grateful and blessed to have you in my life Nathan. Once I made the commitment to join there was no turning back. I was so dedicated and determined to be the best version of myself. I walked across that stage a new person. Although I lost 50 lbs, I was stronger, not just physically but mentally and emotionally. To have that feeling of strength I knew I had won! I’m forever grateful for my Loft family, to my fellow Knockouts for giving me a sisterhood unlike anything I have ever had, to my Coaches Rosini and Denise for both believing in me and pushing me past my comfort zones. To my family and friends and to my little boys for loving their Mama and keeping me going. There’s no place you will ever find like The Training Loft. The support is truly remarkable. We are a family and we welcome you all! After having my son I went through a hard time in my life and adjusted to becoming a single mom. I was strong for my kids but I was juggling several different things. From carrying a full time job as a dispatcher and working graveyard, to providing for my kids and being able to take them to their activities. I almost quit the Training Loft because I was struggling to find the time. When I was thinking about canceling my membership my friend Amber mentioned the Knockouts. I always took notice of these women and saw their dedication, friendships amongst each other, and ultimately their eating and working out habits. So I took the plunge and decided to go for it. When you want something, you make the change. You remember that even when you have kids you make time for yourself as well. I wanted to be healthy for my children, but most importantly... myself! I worked out on my breaks at work and after my shifts. I trained with Rosini and attended the Lofts intense but fun classes. I found that one of the members offers meal prep and hired her so I could focus more on my kids. Jen you’re amazing!! My support system was there to encourage and cheer me on. My goal was to be healthier and show my children that even though you face obstacles in life you can still overcome anything you put your mind and heart into. I was super modest and shy but I met friends who became sisters. I came out of my shell and found myself again. I know I’m a strong woman, but this proved I am much stronger than I ever thought i was. I am so blessed to have had this experience and be a part of an amazing group and gym. I’m forever grateful to my Knockout sisters and gym family. I’ve belonged to gyms my entire adult life. My only concern was what I looked like on the outside. The Training Loft helps you strength your body from the inside out, harder yet smarter. Working on certain muscle parts, such as my core strength, was something I didn’t do often. Now every day I am given a new challenge. I feel amazing and like a better person, both inside and out. I have to thank the Loft instructors/trainers/employees and members for being awesome friends and support system and friends. Hi, I'm Martha. I'm a wife, mom of two kids, and I work part time as a respiratory therapist. I joined TrainingLoft714 in 2014. I went to classes here and there, when I could. In 2015, I went through some life changing events that made me re-evaluate my life and the way I was going to live from then on. Was I going to be depressed and let myself go or change my lifestyle and way of thinking to become a healthier me physically and mentally? I chose the latter. Since then I attended a couple their clean eating classes and slowly changed the way I eat. The class informed me on how to make better choices and how to have portion control. With my new knowledge of clean eating and dedicating to attend classes on my days off, I started to see and feel a change. I felt better about myself and became more confident. The picture to the left was taken in August 2016 and the one to the right was taken in July 2017. I'm still on my journey to be a healthier version of me and I know I can do it with the support from the trainers at TrainingLoft714 and all the positive attitudes of everyone who goes there. By the age of 30 I not only struggled with obesity, but I began suffering from the subsequent comorbidities which included pre-hypertension, an elevated heart rate, sleep apnea and back and hip pain to name a few. As a nurse, going to work everyday was like having to take a look at my likely future and I was not only plagued with guilt, but worried for my health which I hadn’t appreciated until I began to lose it. This picture of me was taken in December of 2014 at my heaviest weight of 273.8lbs. In May of 2015 I joined Training Loft 714 in Benicia and I knew right away this gym was different. I found a place that provided a communal, intimate atmosphere surrounded by an overpour of support from the owner, trainers and members. By December 2015, one year after this photo was taken, I had lost over 70 pounds and by May of 2016, one year after joining The Loft, I lost over 100 pounds. No surgeries, no pills, no meal replacements; all it took was consistency, clean eating and living an active lifestyle. Needless to say my blood pressure has since normalized and I now have an athletic resting heart rate of 52. To date I have lost 110 lbs and am still striving to reach new goals. On June 1, 2016, my fitness journey began. I was 5 months postpartum and needed a huge change in lifestyle to get my body even remotely close to where it was before my pregnancy. I had never really stuck with any workouts throughout my life and was skeptical that I would continue to have the motivation to stick it out here. As most of us are out there, I wanted FAST results! I needed to see change quickly in my body or I wasn’t going to continue. After going for just a month I could see a change in my body! I got excited…it wasn’t big but it was big enough to keep me coming back. As I continued going to classes I started noticing the ladies in the front row. They were sculpted, lean, and pushing their bodies hard to get results. I found out that a lot of them were on the Bay Area Knockouts Team and training for upcoming bikini and figure competition shows. I was so intrigued but thought I could never do anything like that. Flash forward to December 2016 and I decided to go to the informational meeting about joining the Knockouts Team. After listening to Denise, Tye, Rosini, and all of the other Bay Area Knockouts for an hour I knew I had to be a part of this special team. I started training in January 2017 for my first INBA Bikini Competition and was set to compete on April 29, 2017. I was committed to following the meal plan and training with Denise every week. Every day something new on my body would hurt but that’s how I knew my body was changing for the good. Each month I would take a picture of my body to document the progress and I would be amazed each month at the difference I would see. I would not have seen those changes without Denise, the meal plan, as well as support from my teammates and family. In total I lost 30lbs and over 12% body fat since joining the Training Loft a little less than a year ago. I couldn’t be more grateful to Denise for providing me with the tools and education I needed to well exceed my goals on my fitness journey. If you are looking for a place that will provide you with meal plans, weight training, cardio training, and camaraderie then look no further! Thank you Training Loft for everything! I joined the Training Loft about 2 years ago, and it’s been the best decision of my life. I have always had body issues and insecurities. I would join every gym out there but I wouldn’t stay committed. The Training loft is so much more than your average gym. Not only are the Instructors motivating and inspiring but so are the people that come here. August 2016, I decided to really start taking my health seriously and quit saying “my diet starts Monday”. I started going daily to the Training Loft and doing the healthy eating plan they provide. By January 2017, I decided to join The Knockouts, it’s one of the best accomplishments I’ve done so far. If you would have asked me 2 years ago, I would have laughed and said “ya right, there’s no way”. But, now I know anything is possible. Since then I’ve lost 40 pounds and couldn’t be happier. A big Thank you to Denise and all the instructors! In 2013 after the lost of my mom which was my last parent, I became depressed and turned to food for comfort. I was the heaviest I have ever been at 185. pounds. I joined the training loft when it first opened in April 2014, I remember taking a free trail and really not expecting anything out of it. But little did I know it was the beginning of my new life. From the day I walked into the Loft I was surrounded by motivating and inspirational women of all size and shapes. Each one of us with a different story, but one goal in mind… to live a healthier and happier life. I’ve joined every challenge and each time losing several pounds. Along the way I gained a wealth of knowledge on clean eating and how to remain consistent with my workouts. This last challenge that started this past Jan, I lost 20 pounds in 6 weeks. I felt great both physically and mentally. This is the best I’ve every felt! I’m happier, stronger and finished my first tough Mudder. I decided to take it a step further and did my first competition at the Zeus Classic on May 27,2017. I lost a total of 65 pounds. Thanks to the trainers, Rosini and Denise that coached me along the way, the support of the other trainers Mark, Liz and Carol, my family, friends and the training loft family. Elizabeth Bolko, 48 years old. First I’d like to give a little background about myself I’m 35 years old with five kids and currently in the best shape of my life. I work as a registered nurse. I joined Training Loft 714 back in 2015 when my friend’s workout studio closed and I was looking for a cardio kickboxing class. Well I was extremely impressed by Denise’s motivating teaching style and all though I could barely keep up with the high intensity cool cardio moves I just kept moving. I stayed in the back row closest to the wall so I could take multiple breaks and be close to my water at first I was like there is no way I can do these moves but I stuck with it and kept coming to the classes. The more I came the better I was able to pick up the moves and keep up with the pace of the class. The Training Loft members were also encouraging, inviting, and welcoming. I felt like I finally had a place to go to where I could just be me, not a busy mom, or a nurse, or a wife, or anything else. I allowed myself that one hour for class each day or every other day to work out and be in my own head. After taking several classes including the pumped class which introduced me to weight lifting I started becoming stronger. I was officially addicted to the Training Loft classes taught by Denise, Mark, and Liz. Because of Training Loft I had the courage to participate in Spartan races something I would never think I was capable of doing but I felt I was strong enough and wanted to challenge myself. I knew about the “Knockout girls” but didn’t really think it was something I could do. I attended the Knockout meeting in December and made the decision in January to go for it. I started the clean eating diet in January and a 12 week prep in February. With the precise meal plans and work out plan created by Bikini knock out posing coach and trainer, Rosini. Rosini said,” You gotta give me 110% if you’re going to do it.” I actually gave it my all and followed exactly what she said. I learned that I can commit to something and be self-disciplined when it comes to food and work out plans. I also had a coach who believed in me. The Training Loft instructors/trainers/coaches and members were completely supportive in my new journey. I actually started seeing a huge change in my body. I “trusted the process” already because I’ve seen time and time again The Knockouts before their competitions and they looked amazing. I now understand the importance and value of the right nutrition and how it impacts the body. I learned how to lift weights correctly through my personal training. I found a way to get my work outs in while balancing my work and home life. I kept a food diary and planned out my work outs ahead of time based on what Rosini recommended. I also learned how to pose through posing practices. I truly can’t express how thankful I am for the TL714 instructors/coaches/trainers and our members. I feel like I’ve made some new life long friends through this process and I want to continue to inspire others that anything is possible if you put your mind to it and we at TL714 will encourage and support you to reach your personal goals. I am a wife, a mother to five amazing kids, and was able to get on stage and compete in my first bikini competition . I joined the Training Loft in 2014 and during my first year there, I met many talented and hard-working women who became more than just my friends and fellow gym partners. They were an inspiration to me for how I could improve my own health, be fit, and even wear a bikini without reservation. I realized many of these women go through what I go through myself such as having a full-time career, being a mom and a wife, and leading busy lives who many like myself once placed health & fitness as our least priority. 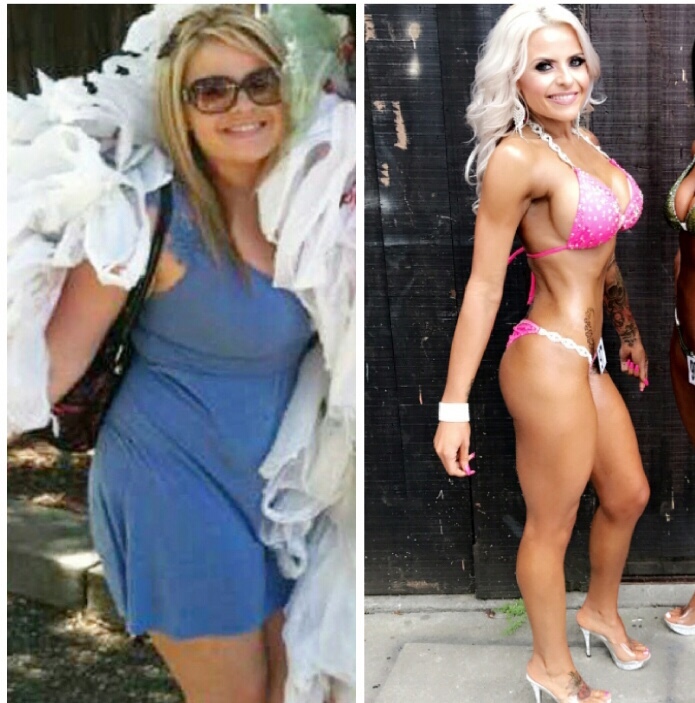 Being around these women and seeing many of them become bodybuilders inspired me so much that I decided to embark on that journey to get under the spotlights and walk in those flashy bikinis. In 2016, I lost 33 Lbs., competed in two body-building competitions, worked/trained alongside some of the most talented people I have ever met, and have not turned back since then. Rosini kept pushing me to work harder every time I said I couldn’t. Even when I felt my body couldn’t take it anymore, she still made me work. She believed in me when I didn’t and helped me believe in myself. And despite the hard work, it has changed my life and I don’t know where I would be without her. For all that I have accomplished, I have Rosini, Denise, all the awesome trainers at training loft 714 and all of my fellow Bay Area Knockouts gals to thank who were and still are part of my life and my new health & fitness journey. I am 39 years old and have always been pretty active coming from doing dancing, biking, gymnastics, and at my older age just maintaining by joining different gyms and doing basic cardio and classes like step and jazzercise until the day I met Denise Moore Brazeal found the love of Tae Bo/Cardio Sculpt and hired her as my coach/trainer and joined Training Loft 714..I knew I wanted muscle but when I was inspired by Denise and the first few girls on the Bay Area Knockouts Team and saw each ladies transformation week by week that was the time I became addicted, inspired, motivated and found my love for weight lifting, cardio, and building muscle. It is true what they say "You are what you eat" but with a lot of support, dedication, self-discipline, and clean eating you can achieve anything.... Here at the loft you will even achieve much more than just that. At TL714 it is not only a gym but a home away from home where you can build strong bonds like family and build a sisterhood like I have. Don’t ever let anyone tell you can't and always believe in yourself. My Story, My Journey! It all started June 23,2016 when I decided to contact The Training Loft to get more information about their transformation program. I was currently going to a regular gym, but I felt I needed to do more for myself. Here I was checking my email and I see a response from Denise I was happy she answered all my questions, she also suggested I come try out one of the classes. So I did and it was the best thing I could have done on June 25, 2016. Everyone at The Training loft was super nice and I felt welcomed, the class was more than I expected it was just an amazing feeling that same day I decided to become a member and definitely no regrets. On July 9,2016 I took on the challenge to prepare for my first Bikini Competition. With the Bay Area Knockouts It was a 15 week process which involved, weight training, meal preps, posing sessions Etc. During my first week of my challenge I wanted to quit, I would ask myself can I really do this , so I kept going because I don’t like to quit. I would Train every monday with my Trainer / posing coach Rosini , During my workouts I would make faces, sweat like crazy, I would say I can’t do it. But there she was my trainer telling me come on girl, you can do this. If only one knew how powerful those words were to me, If felt like I could anything. Finally the date of the competition had arrived on October 22, 2016 I stepped on stage and competed for my first INBA Bikini Competition. That day I told myself you did it. I never gave up on my challenge I proved to myself that even though I would be called crazy, obsessed and other things, I actually took all those words and turned them into a positive outcome which got me where I am now in a very happy place and most important with myself. To The Training Loft I will forever be thankful for everything, all the support, all the confidence I now have. I thank you for reminding me who I really am, A person who Loves Herself. As I write this, I am 62 years young, and feel better than I ever have. I am proud of my outward appearance as well. Before I came to the Loft and met Denise Brazeal, my exercise and diet program was one of inconsistency. I would yo-yo diet and hit the gym without the training and support that I have received here. Denise introduced me to "clean eating" and instilled in me to "trust the process". Prior to her support and education, I had never understood the value and results of this way of life. I shared this form of nutrition with my husband who embraced it as well. Our family meals revolve around the clean eating ethic with occasional dalliance into "treat meals". We then quickly return to the "program". In fact, we actually look forward to it! When I first entered the loft for workout, I thoroughly enjoyed the regime and left tired, sweaty and overjoyed! I couldn't wait to come back. From day one, I felt welcomed by everyone. Over the years, I have had several personal trainers. However, until I partnered with Denise, I never understood how beneficial a combined workout, diet, and overall clean lifestyle could be. During six months of dedicated participation at the loft, I became enamored with the "Knockouts". I observed their hard work, their support for one another and the fantastic physical transition that they obtained. I queried Denise if I could be a candidate for competition. To my amazement, she informed me that not only could I compete, but that I could prevail. She said she would help me achieve goals that I may have never thought possible. She was honest and to the point that it would require hard work and perseverance. That it would not only be physically challenging, but mentally challenging as well. She stressed the importance of having the full support of my family. I left the Loft that day ready to begin the journey to competition. That evening, I discussed my decision with my husband. He not only said go for it, he ensured me he would give any/all support required. I informed Denise of my decision to go forward and prepare for competition. We set up a weekly training schedule and went to work. In August of 2016 after a year of preparation, I stepped on stage in Petaluma at the INBA competition. I competed in both the Ultra Grand Masters and the Bikini Open competition. I was extremely nervous, but also very excited. I felt well prepared due to the support and training that I received from my posing coach Tye and of course my training coach Denise. The camaraderie and encouragement from so many of the other girls that train and workout at the Loft, only added to my confidence and exuberance. Words can't say enough to quantify my happiness, satisfaction and enjoyment that I receive by being a member of the Loft family. I continue to enjoy and look forward to my weekly personal training sessions with Denise and the group workouts. This journey is a continuing one that I hope lasts a long time. My sincere thanks to all. My admiration holds no bounds. My journey has been rewarding beyond my dreams. My message to all is that it is NEVER too late to achieve your fitness goals. After suffering from a back injury and then having two kids, I thought all hope was lost. Nothing kept me motivated. It was always saying "I’ll start my diet on Monday... or my back hurts too badly (which at times it did)." The Training Loft doesn't have a "good" support system... It has the best. Anything and everything you need to succeed. Energizing classes, personal training and clean eating workshops - it was made to make everyone succeed. I am proof of that. I started taking classes in October 2014 at 180lbs. Since then I’ve lost 60lbs and competed in my first bikini competition. I can't even began to describe my gratitude for everyone at the training loft, especially Denise who has been there day in and day out. Since losing this weight, my back rarely hurts and I’m able to play with my kids. I feel like I finally have my life back. Thank you Training Loft from the bottom of my heart. In that before pic I was unfulfilled, depressed, and not living to my full potential. I had been athletic my whole life and I found myself in a slump that only this place was able to pull me out of. The loft was a place I could go to get an incredible workout and learn the right nutrition to make me look and feel great, both mentally and emotionally. The workouts pushed me past self-imposed limits and the diet definitely took some getting used to, but once I got the hang of them both I became addicted. I want to take a few sentences to give credit to the women who started this place. Denise Brazeal is very competent, passionate and professional when it comes to teaching classes, personal training, explaining nutrition, and competition coaching. She's the real deal and practices what she preaches. I was trusting and confident in her and she got my body looking fabulous. Nowadays, I totally look forward to the gym and I love feeding my body with good clean foods. I can honestly say I am thankful to have tried out "this new gym in town" because if I hadn't then I don't see how I would have the healthy body and state of mind that I do today. I lost 60 pounds in a few short months. It totally changed my life in so many ways. It took self motivation, dedication, hard work and also days of wanting to give up and tears. With the support of Denise and members of the Loft 714 I pushed through and met my goal. I continue to clean eat and work out regularly and live a healthy lifestyle. Huge thanks to all that the Loft has to offer!!! All of my life my fitness goals seemed just out of reach. But that was before I came to Training loft 714. It was here that I discovered that I was able to achieve a level of fitness well beyond my wildest dreams with help from an awesome community and guidance from my coach. Not only was I able to get motivated and stay motivated, but I was finally confident enough to compete in my very first fitness competition. After my 16 week preparation for the show I already felt like a winner but when I placed it was an even greater accomplishment. Whether you want to compete or just get in shape the training loft has the tools to get you through whatever fitness journey you wish to take. I can’t thank my TL714 family enough for the wonderful things they do. This is the place for anyone seeking a healthy lifestyle. I began my health and fitness journey in 2011, so I thought. I joined Weight Watchers and began to exercise, but I wasn't seeing the results I was looking for. I began to get discouraged, and my workouts became more sporadic. Although I would lose a few pounds here and there, I could never seem to reach my goals. In May 2014, I joined Training Loft 714. That's when my journey got real! I became focused, committed and determined to reach my goals. That's because I didn't just become a member of another gym, I became a member of a very diverse family. At TL714, we push, support, motivate and encourage each other. We also acknowledge and celebrate each others accomplishments. Denise Brazeal is an awesome trainer and motivator. She definitely provides us with the tools and the information we need to be successful. After a full year of consistently working out and learning how to eat clean, my body has truly transformed and I have not only reached, but I have exceeded my goals. I am healthier, fit and feeling fabulous at fifty! Thank you Denise Brazeal and my TL714 family for making such a positive impact in my life. New goals and new accomplishments to be reached. This journey has become a lifestyle and it feels so good! I'm on a mission! For most of my life (I'm 37) I can remember being quite active, whether it was bike riding with my dad, going to the gym, swimming in college or paddling with the Benicia outrigger crew. But sometimes life throws out a curve ball and about 10-12 years ago I withdrew from the level of activeness I had become used to. Throw in a marriage and two kids and I had pretty much lost any and all time to myself. I would go for walks when I could but it just wasn't working for me, not at the level I wanted to be on. In April of 2014 I had heard of a new gym getting ready to open on first street and I was more than ready to make a change both physically and mentally! So I dropped the little ones off at school and decided to go check out The Loft. I was expecting it to be a "gym" when I walked in the door but instead it turned out to be much more! Actually, when I realized it was classes, I was a little skeptical. I had taken maybe two group type classes years ago at the average gym and was not a big fan. Well, turns out it was because I wasn't at the right place because I've now lost over 35 lbs and still going! The Training Loft is so much more than a "gym", it's full of support from both staff and other members. Denise is truly one of a kind, she is incredibly knowledgeable and talented, an absolute inspiration!! I have become addicted to the Loft and the incredible vibe that comes from being apart of something that has helped me to see that with dedication and the proper tools, I can transform myself into the strong, energetic person I once was. And this is only the beginning!! For years I have struggled with my weight, I was always uncomfortable in my own skin, nothing fit right & I never felt good about myself. This past March I decided to take charge of my health & fitness. 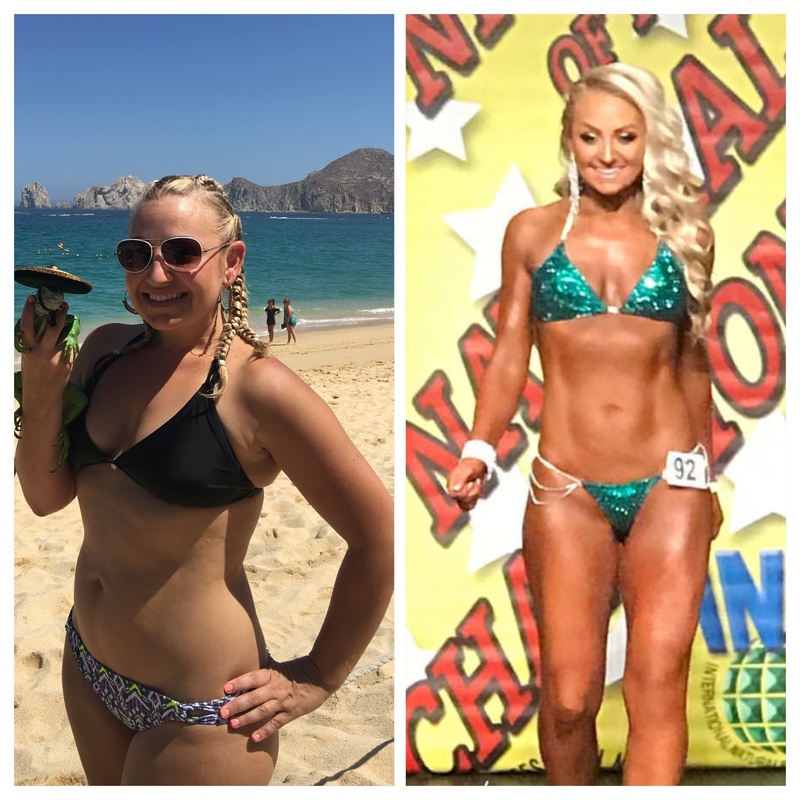 I made the decision to enter a figure competition on my own and started to get discouraged when I wasn't seeing any change. A friend told me about Training Loft 714, Denise & The Knockouts. I went to check it out and Denise took me under her wing and gave me all the materials I needed in order to succeed & reach my goals. But I learned that Training Loft 714 is so much more than that, it is a transformation studio. Not only did I reach my goals, I achieved more than I had anticipated, I made new friends who share the same journey, who are very encouraging with each other and a new me. This is not a typical gym, it's a family and everyone helps each other become their best. I'd never had much success with previous gyms. I would loose a few pounds here and there, but that's about it. After a few weeks I wouldn't see much difference, get frustrated and quit. The weight would come back and I'd become more upset with the way my body looked. In April, I decided that I'd had enough and it was time to get healthy. I joined Training Loft 714 and I was immediately addicted. Within 60 days I had lost 14 lbs, 16 inches and 9% body fat. Friends and family literally didn't recognize me. Not only was I looking thinner, but I had more energy and had become so much stronger. I had more confidence and actually got up on stage to take part in a bikini competition. The reason I was so successful had everything to do with 714! Everyone there is like family. We are there to motivate and support each other, not compete against one another. Denise and the entire staff care about the success of every single member. If you want to accomplish your weight loss goals, you absolutely need to go to Loft 714! Thanks for everything Denise! You're an inspiration to all of us. Not only are you an amazing trainer, coach and mentor, but you are an incredible friend!!! I've always had a dream to look good in a bikini. 3 kids later and at age 40, I finally did it. In order to make that dream into reality, it took an extreme amount of determination, dedication, self-discipline and sacrifice. It wasn’t easy, but with the support and knowledge of the people who helped me, it only took me 12 weeks to correct my eating habits and learn how to stay on track! Denise guided me all the way, and believed in me! Training loft 714 is a place with positive and motivating people. When I’m there I'm surrounded by people with the same goals as me and they push me through the workouts! If u want it bad enough, then do something about it. Not tomorrow, but right now! You will thank yourself a few months from now! Working out and eating clean was my way to challenge myself and circumvent turning 40. Age really is just a number. Today, I am in the best shape of my life- physically, emotionally and mentally. The best decision I ever made for me and my kids was joining TL 714 knockouts. I recommend TL714 to anyone who wants to make a healthy lifestyle change. Beyond TRX, cardio classes and weight training, I have learned how to make better food choices, clean nutritious eating, relaxation techniques through yoga and so much more. These are tools I pass on to my children and family. Living a healthy lifestyle is a long term choice and an ongoing process. Join us at the Loft! It's more than a gym it's a family! I am not a weight loss success story. In fact, I weigh about as much now as I did when I was newly divorced, stressed out and unhealthy. I was 128 lbs, "skinny" and without muscle tone. As a career commuter and part time student, I was also prone to injury from hours sitting at a desk, in a car and in a classroom. I began working out at home using various DVD's and through self-directed sessions at a local gym. Initially I saw improvement, however I reached a plateau in 2012. I was no longer gaining muscle, my weight was starting to creep up and I was experiencing back, neck and shoulder pain. I began strength training sessions with Denise in January of 2013. Like most people, I have a very busy schedule and I appreciated the fact that Denise respected my time. Sessions were only a half hour, but she made me work harder in that half hour than I was able to push myself in hour-long sessions on my own. Denise encouraged me to add cardio classes to my workout routine, and although I've never liked group classes, Denise's classes changed my mind. Today I weigh 125 lbs, not so very different from where I started, but I've gained so much. I now have a formula that works, including cardio, strength training, healthy eating and an amazing, supportive community in the members of TL714. I have transformed my "skinny-fat" injury-prone body in to one that is lean, better able to resist injury, healthy, and toned. Denise, and the members of TL714, keep me motivated, energized, accountable, and on track. I encourage anyone, even if you are not looking to lose weight, to experience the benefits of building a healthier lifestyle. We are so fortunate to have a person of Denise's caliber in our local area. If you are looking to up your game, you can do no better than TL714. After having my second child, I was at a point in my life where I was having constant back pain from my physically strenuous job and feeling like I had little energy for anything else. Working in the health care field, I knew how important it was to exercise and lead a healthy lifestyle but I was either too busy with life or busy taking care of everyone else. I heard about Denise's weight loss program from a friend in December 2013. I had attended the meeting with the intention of supporting her in the program but was not ready to make the commitment myself. However, that same day after going home, I decided it was time to take care of myself for once and to stop making excuses. What made me really excited about going through this transformation was the overwhelming support from the others who have gone through this journey. They have been there every step of the way as well as Denise's commitment and dedication to my overall well-being. In just 4 months, not only have I lost 25 pounds and a total of 10 inches, I've also gained invaluable knowledge and insight of how to maintain a balanced and healthy lifestyle which has also affected my family in a positive way. I'll be hitting the big 4-0 next year and the best thing about it is that I've never felt this good before! i started to put on weight during nursing school. eating fast food and drinking venti white mocha every single day! I was going to school full-time and working part-time on the weekends. i was always tired and made excuses and didn't go to the gym consistently. I knew i was putting on weight but I was able to hide in my loose fitting nursing scrubs...all that changed when I was introduced to Denise! I started taking her classes and eventually started personal training too. My weight dramatically dropped just after a few months and from then on, I was hooked! I went from size 8 to 2 and lost almost 35lbs...and i am currently prepping for my 5th bikini competition! Throughout my weight lose journey I have struggled. When I started with Denise almost two years ago I was looking for something different, something that really worked for me. I finally found that with her and have never been so happy with my accomplishments in weight loss. She is not only the best instructor I know but best trainer, supporter, mentor, and friend that I could ever have. I just want to thank Denise for being my fitness rock for the last 2 1/2 years. Without her, Lord knows where I'd be. She's been by my side from the time I weighed 260lbs all the way through hitting my final goal of weighing 150lbs! And even then after I enjoyed my honeymoon like a rock star and gained back 20lbs :) She helped me get back on track and has let my cry on her shoulder many times. She's a true inspiration, a constant strength and puts herself last, way more often than she should. She's not just a trainer and a nutritional resource. She's become a true friend who has literally been by my side helping me meet my fitness goals through an engagement, my wedding and now, staying fit and healthy to become a mother. I wouldn't have it any other way. From the highs to the lows, the tears and the goals, the low self esteem and the final acceptance of loving me, she's been there. My life will forever be blessed and better thanks to Denise!! In the early stages of my trainer's competition (Denise Brazeal), I slowly witnessed Denise's transformation and I was truly impressed and amazed. I remember thinking -- could I achieve something like that? Most of the time, the answer I in my head was "no". Until one day, I build up enough courage and approached Denise to tell her "I want to compete". She said absolutely! It is not going to be easy, but if you are ready, I can train you. I was ready. Reality hit me pretty quickly, and I realized what I had committed to and there was no turning back. I entered my first INBA competition in September of 2013, feeling confident. Although I did not place, it was one of the most personal and gratifying experiences. If I can inspire one person, motivate and change their view about themselves, the way Denise has inspired me and change my outlook in life, that would be the greatest compliment I could ever receive. Through my continued training with Denise, I continue to change my body, my workout, my commitment and another chance at the stage...20 pounds lighter, 18% body fat and competeting in my 2nd INBA competition at 53 (2014, Silver & Black), I feel amazing, I feel confident....I feel I can achieve anything....Thank you Denise! (TL714 - come see what's in stored for you) -- "Never limit yourself as to what you can achieve by your age"
I always believed that you shouldn't let your weight stop you from your goals. That if you truly believed in yourself you can do anything. I was 237 pounds and could run marathons, and do tough Mudders, but I was slow. I wanted to get in shape and push my limits. I wanted to reach new goals. January 2013 I began my journey with Denise. I followed her clean eating program, took her classes and personal training. I watched my body transform with all the classes. I have never felt better. I started competing with her competition team TL714 Knockouts and lifting heavy and being able to do things I never knew I could do, but with her I started believing in myself and with that the progress followed. Thank you Denise and all of the TL714 family for always supporting each other and pushing each other. Without an amazing support system like we have here I know my journey would be a lot tougher! I have never felt better than I am at this point in my life- both physical and mental. I have tried several gyms, joined different exercise classes and experimented with fad diets to "feel" good and "look" good, but didn't get to achieve my goals until I joined a workout place where Denise Brazeal taught. Under her professional training, supervision and exercise regimen that will continue on to her new place at TL714, I am reaching my goals and will continue to achieve them. The cliche that "fitness is a way of life" is a familiar phrase we read or see often as a slogan but doesn't take on a significance until you LIVE it: by being smart in your food selection, be consistent in your exercise routine and most of all be surrounded with people who lives by the same mantra as you do. I want to start off by saying TL714 is a life changer.... I started coming in late September 2014 and have been hooked ever since. I've always been active, but I have never been happy with my body. I have tried every fad diet out there with no long-term success. Then I discovered the Loft and met Denise... Because of her, I not only enjoy working out, I live for it. The classes are fun, I have learned about eating clean, and I am constantly surrounded by uplifting people. My new family. In the past year, I've become more confident with my appearance. I have learned not to care too much about a number on the scale. Earlier this month, I competed in my first figure competition and felt great. A year ago, I wouldn't be caught dead wearing a bikini in public, let alone on a stage in front of judges! I am beyond grateful for everything TL714 has given me; new friends, more confidence, and the best support group anyone could ask for. The Training Loft 714 has saved my life. I started attending classes late May 2015. The first class was so tough I didn’t think I could finish.I remember seeing all these beautiful fit people and felt intimidated but I stayed anyway. At the end of class members came up to me and told me how proud of me they were by sticking through it. I didn’t even know these people! This is what the loft does. We ...are all a family and we support and encourage each other. I have lost 50lbs here in less than a year! Before the loft weighted at 231lbs. I had low self-esteem and didn’t think I could lose the weight. At 6 months old I acquired a very rare disease that left me with bone malformations and scars that I was always too afraid to show. Having physical limitations left me depressed and filled with negativity about myself. To this day I have learned to modify every workout and actually work do the cardio classes on a stability ball! The loft has taught me that anything is possible. Even when I didn’t believe that it would work I still came and one day I looked at myself in the mirror and said “It worked. It’s WORKING”. This place has it all! From cardio to weight lifting, nutrition plan (not a diet!! who hoo!) and awesome trainers it truly has all the tools for you to succeed! all you have to do is show up. It’s really that simple. The loft has taken me in as family and my weight loss could of not happen without the members and amazing staff. I currently Train with Mark and Rosini. I told them my goals and they are there with me every step of the way. Not only you will reach your goals but you will also gain an amazing fit family! I owe this place my life! Thank you TL714!